I have this problem where every single time I go to the grocery store I buy a handle of bananas and they get too ripe by the time I can eat them. I’m not just going to throw them away–so I freeze them. Lately, it has become this issue with my roommates because there is literally bananas falling out of the freezer when we open it. Today I decided to be a good housemate and make a little room for Jeff’s Hot Pockets by making myself some Nicecream (banana ice cream). Plain old banana ice cream is too boring for me, I need layers and crusts and stuff or I just won’t feel satisfied, ya dig? 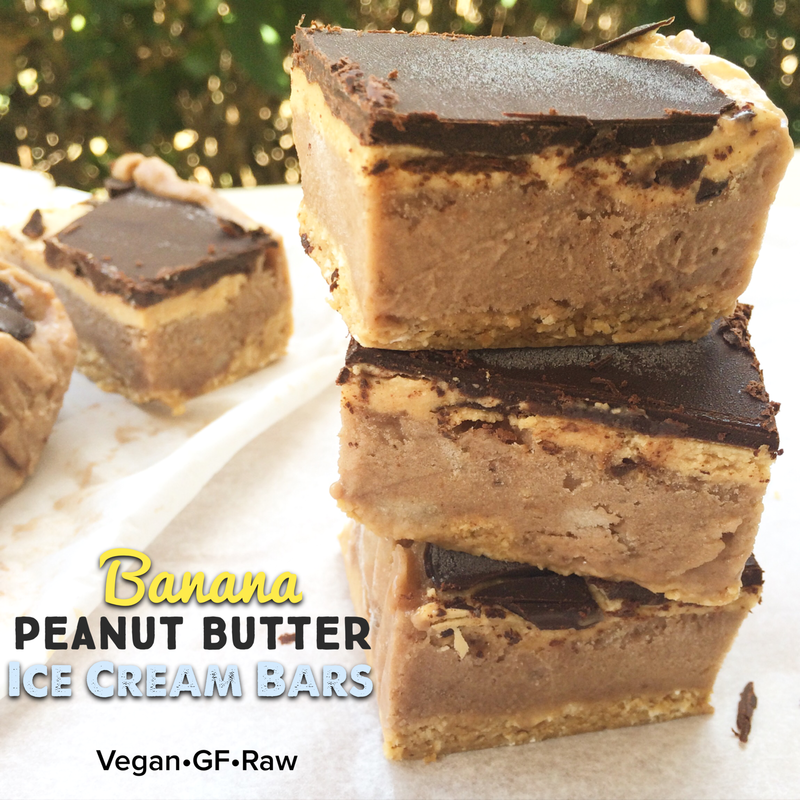 Behold Banana Peanut Butter Ice Cream bars with an Oatmeal Cookie Dough Crust. I may have added a little protein powder to the ice cream part 😉 but it can be completely eliminated and taste just as great. For the peanut butter layer I used Nuts N’ More. I honestly have to say it is my favorite peanut butter on the planet and I might actually cry real tears when I run out of the jars they were kind enough to send me (because I will be spending my own money to buy a hundred more jars). You can get 25% off any PEScience product like the Milk Chocolate Protein Powder I used by using the code PBCHOCO. I was able to purchase almost every single ingredient I used in this recipe from VitaCost.com. If you haven’t heard of it, it is truly one of the easiest and most cost effective ways to get all of your health food products in one haul. AND the best part is that is delivered the next day to your front door! I am always impressed with their quickness, I don’t know how they do it! In a bowl mix together all oatmeal layer ingredients using a fork. Press the dough flat into an 8×8 inch pan lined with parchment paper. Using a food processor or a high performing blender, pulse bananas until you have an ice cream like texture. It can take a couple minutes but be patient it will happen. Add in protein and peanut butter and pulse until well combined. Pour your ice cream layer over the oatmeal crust and place in the freezer for 20 minutes to harden a bit. Once hardened, spread an even layer of peanut butter over the ice cream and return to the freezer while you make the chocolate. Melt coconut oil and maple syrup together and then mix in cocoa powder. 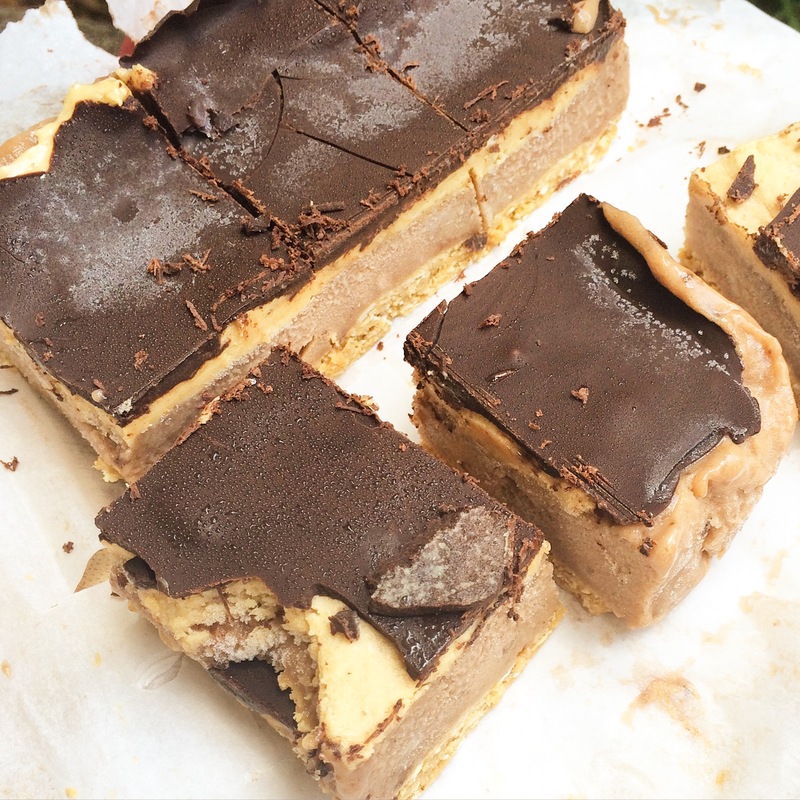 Pour over peanut butter layer and let set in the freezer for 4-6 hours before slicing into squares and serving. Makes 12 Ice Cream Bars.